A family that WoWs together, plays together. Chronicles of a family of four as they try to manage an ever growing online family of characters. My new Gardening Blog is at the Centre Daily Times, our local newspaper. 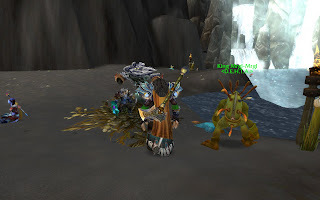 Everything I ever wanted to know about raiding and was afraid to ask. Woo Hoo! It was with great sadness that I read Bid Red Kitty's announcement that he is leaving the World of Warcraft. It is wonderful for his family, but sad for those of us who have come to rely on his wit and wisdom. Even my kids loved his hunter guide movies. Noob or raider, there was something for everyone at BigRedKitty.net. As sad as it to lose yet another top notch player who is willing to share his/her knowledge with the rest of us, it is sadder still to think that a really great writer/blogger is giving up the medium. I sincerely hope and pray that Big Red Kitty as Daniel Howell will find another outlet for his wonderful writing. Both my parents are writers. My mom's book Women of the West, is still in print and is a recognized classic in its field. My husband has a wall full of journalism awards. And I write. For years I had a monthly gardening column. I blog here and other places on various topics. And I'm hard at work on my book (it's for kids). So Daniel, if you read this, Please Please keep writing. If not about Wow, then about something. Your military stories are wonderful and deserve their own book. Of small pets and guilds and gold. It has been a while and there is much to report. Guild news first. Our leader has tackled his RL challenges and is back in the game, although it has been a few days since he's been on. We are rebuilding. And I am now number two. Just call me the "The New Number Two." (Any one remember The Prisoner? Anyway, I am the New Number Two, able to do anything that needs doing while the GM is away tackling RL issues. And Let me be the first to say that RL is more important. I have found my old guildies in a new guild and have join them with my own number two, Sampeaire the Shaman. Who is really my/our first toon. She a few levels away from the Outland and leveling inscriptions. Since Theo hasn't been doing anything other than a few dailies and trying to salvage the remains of the guild, we're going for the pet achievement reward: Shop Smart, Shop Pet...Smart. And we now have 47 little pets. I got the Alliance chicken quest pet last night. And a new guild made me the Yeti. I farmed him a White Kitten. He needs five more pets. I grinding on fireflies, and working on my rep for Sporeggar for the Tiny Sporebat, and also on my rep with the Sha'tari Skyguard for Nether Ray Fry. 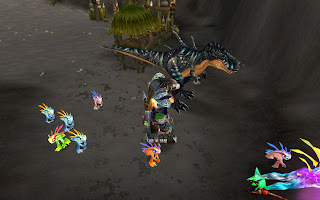 And checking the daily fishing quest for the the Crocolisks in the City quest for one of the rare baby croc pets. But true be told, I will probably have to wait to get the Children's week pets to get this achievement and the skunk pet. People on the Auction House are STUPID! Don't flood the market. Put up 1 to 3 items, not 24. Playing the AH is perfect for someone who can only be on for a little bit here and there. So I buy a bit and sell a bit. Nothing is sadder than watching players cut into their own profits. So how can you make money if you don't flood the market and don't undercut the competition? For trade goods, just remember they will sell...eventually. And people ALWAYS need them. So instead of putting up your lots of Goldclover or Wool Cloth or Nether Essence at a lower buyout price than the lowest buyout price listed, put yours up a bit higher. The lower ones will sell, and then yours will. It might take an hour longer to find a buyer but you will make more gold instead of less. Setting odd and lower bid prices and a shorter auction time along with just a few stacks works, especially if there are relatively few items posted. We joined a really nice guild with two great guys running it! Hurray! We became an officer in the guild. The guild had a 4-tab guild bank, a website and Vent and great people. We were running instances together and talking and laughing and helping each other. I was able to complete the meta-achievement for Winter Veil with their help. The holidays came and everyone had a lovely Christmas. My son got Spore, which had to be played at the expense of WoW, but that's okay. And then we left for a long, internet-less, visit with the in-laws. When we got back, everything had fallen apart. My character was still at level 80, but the guild was dying. Today I am the only officer. One leader quit playing altogether. The GM has been AWOL for weeks. All my favorite people /gquit. Our tank is gone. Our awesome mage is done. Druid gone. All gone. There are a handful of people still in the guild with a couple of 80s, but most left for raiding guilds or just to get away from whatever bad vibes were happening while I was away. So here I am with a guild and a 4-tab guild bank and a handful of players to take care of. Level 75 here we come...sort of. The first round of holidays are over. But we are firmly in the holiday season. Dec. 1 we had a birthday party. Dec. 6 is St. NIcholas Day, and free cartoon day at the local theater. Then there is a play the boys are in, and then a Christmas pagent. And then the in-laws are back for the weekend before Christmas. And we have to go get our tree and then put it up. And mom has to shop for stuff. Meanwhile, I've been able to get our main character, Theothana of Kilrogg, up to almost 75. No else is doing anything these days and I feel bad for them. But that's the way it is. Loved just about everything in Howling Fjord. And we're now working our way through Borean Tundra. I don't care that most of the quests in our log are green. It's too fun. The story line is great. Best quests so far were the Murloc quests. Loved the baby murlocs and the Night elf in the murloc suit. Mom can't play much, but the boys sure can! Goodness, my little Jem likes playing warlocks. He's got his main lock almost to 10. And has started a second one, a human female this time. Like any "good" mom I try to restrict his play time. 20-30 minutes after school, or maybe after dinner. His brother's mage is doing well also. And the brothers together the other day completed their first quests ever solo. Which means they did them together, but without mom's help. Both quests seemed to involve killing Boars in near the village of the dwarves near Ironforge. Mostly they run around following each other, killing yeti things, and screeching at each other from across the room. And then they go outside and play in the snow. Life is good.